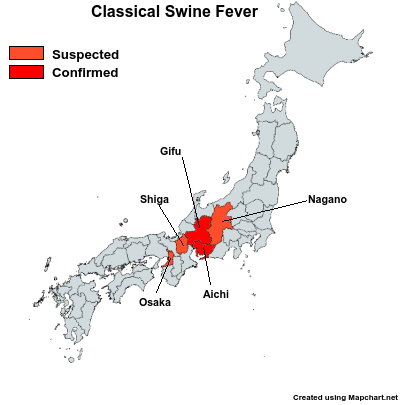 While China, Vietnam, and Eastern & Central Europe deal with rapidly spreading African Swine Fever, since September of last year Japan has been contending with the return - after an absence of 26 years - of Classical Swine fever. Today Japan's MAFF announces their 12th farm (and 10th in Gifu Prefecture) to test positive for the disease. Today, suspected affected animals of swine fever has been confirmed in a pig farm in Gifu, Yamagata Prefecture. The farm, has been located within the movement restricted area of 11 cases eyes of the farm, March 5 days later, we do not the movement of breeding pigs. (1) Gifu Prefecture, March 22 (Friday), from the farm, received a report of a feeding pigs and has a loss of appetite, we conducted a site inspection by animal health inspectors. (2) the same day, because the suspicion of swine fever is caused by the inspection at the Livestock Hygiene Service Center, was subjected to a thorough examination, today (March 23 (Saturday)), has been confirmed to be a suspected affected animals of swine fever directly below. The twelve farm outbreaks to date only tell part of the story, as the virus is also spreading through wild boar in central Japan. 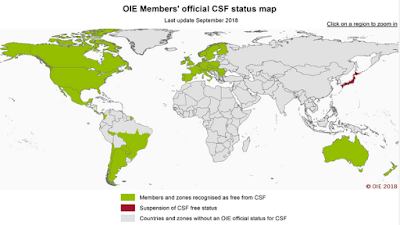 The most recent OIE Notification (March 15th #29853) - Japan's 20th since the outbreak began - adds nine more wild boar to the list of CSF positive pigs. 1. The 11th affected farm (Yamagata city in Gifu, 06/03/2019) Disinfection of contaminated materials, tools and facilities was completed on the 9th March at the affected farm. 2. The 8th affected farm (Toyota city in Aichi, 05/02/2019) Removal of movement restriction zone (MRZ): On 00:00 of 13th March, movement restrictions, which were established within 3km radius of the affected farm, were lifted as 28 days have passed after the completion of full implementation of control measures (stamping out, disinfection etc.) at the 8th affected farm. 3. The 10th affected farm (Mizunami city in Gifu, 18/02/2019) Removal of shipment restriction zone (SRZ): On 00:00 of 13th March, shipment restrictions, which were established within 3-10 km radius of the affected farm, were lifted as 17 days have passed after the completion of full implementation of control measures (stamping out, disinfection etc.) at the 10th affected farm. As of the 14th of March, 874 wild boars (115 dead and 759 captured) in Gifu prefecture have been tested and 215 (71 dead and 144 captured) were found to be positive for CSF virus (CSFV) by RT-PCR since 13th of September. 122 wild boars (15 dead and 107 captured) in Aichi prefecture have been tested and 12 were found to be positive (one dead and 11 captured) for CSFV by RT-PCR since 14th of September. Among the other prefectures, 246 wild boars (223 dead and 23 captured) in 40 prefectures were tested and all were found to be negative for CSFV by RT-PCR since the 14th of September.